The day after Christmas my family took a vacation to Amelia Island, after a couple of days first spent in Savannah. This was our first time on Amelia Island and really our first family vacation in Florida that didn’t include The Mouse. The weather was really nice, most days there was a high of 68 degrees; jeans, a tee shirt and a hoodie were our everyday attire. We stayed at The Ritz-Carlton, which is right on the beach and very casual. Our room was very comfortable; the closet and drawers were big enough to hold ALL of our luggage and clothes (if you saw the video from the Savannah blog post, you would know that’s a big deal). I found the beds comfortable and there always enough towels. The bathroom was large and accommodated all of our toiletries. We started off with a coastal view room of the dunes and the ocean around the corner, but we were upgraded to an ocean view room and it was very nice; we could see the sunrise. Every room has a balcony with a table & 2 chairs. There is a mini-bar in the room. I’m not sure if there was a dvd player because we barely turned on the TV. The the rest of the hotel was just beautiful and decorated to evoke an elegant, yet relaxing atmosphere. Because it was Christmas, all the common areas were beautifully decorated for Christmas with greenery, lights and a Christmas tree; there was even a HUGE gingerbread ship in the lobby. Unfortunately the decorations were taken down without warning overnight on Dec 30th and we didn’t get to take any photos. The hotel had 2 pools, 2 hot tubs (indoor and outdoor) and a kids’ pool with a rain umbrella. There was also a playground near the pool. Outside of the lounge on the patio was a big firepit surrounded by sofas. Beyond the patio was a lawn perfect for playing and used for various programs. Surrounding the green space were lawn chairs and fire pits. 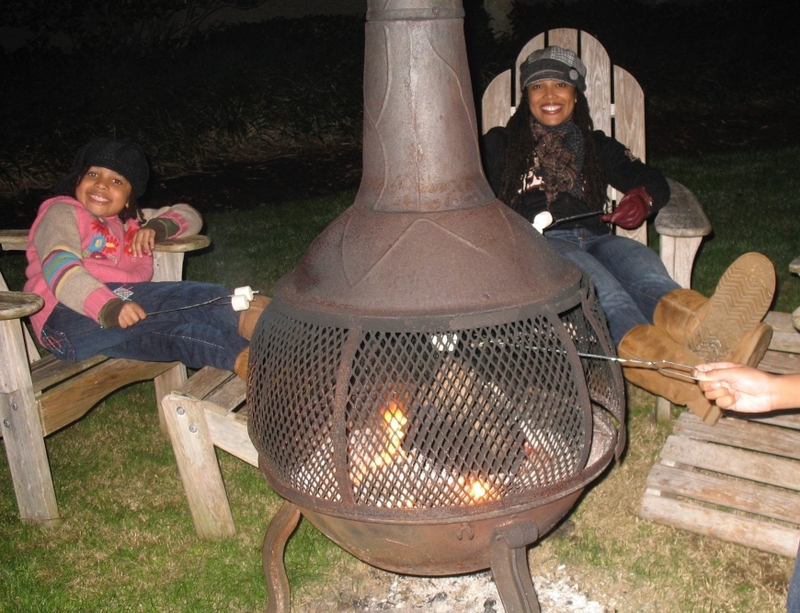 We really enjoyed sitting by our own fire pit each evening talking and gazing at the stars. There are 2 restaurants on site and food could be ordered in the lounges and at a poolside grill as well (the poolside grill was closed for the winter). We ate at the lobby lounge a couple of times; there is a limited menu of burgers, cheese plates, salads and chicken wings. We ate breakfast, lunch and dinner at Café 4750 and it was very good, if expensive. The breakfast buffet was the best! The lunch and dinner menus were similar, so it was good that we were able to eat outside the hotel for variety (and less expense). We did not eat at Salt, the 4 diamond restaurant, although we heard it was very good. There was also an adult sports bar with a pool table. We didn’t go in there because of our kids, but we did poke our head in; it was very nice and had a more contemporary vibe than the hotel lobby bar. This Ritz-Carlton is very family-oriented. Although my kids didn’t take advantage of it, there is a Ritz Kids room that looked very welcoming and fun (for an extra fee); it was located just beyond the pool. In addition, there is an unsupervised teen space for ages 13+ called “Our Space”; my son hung out there a bit and really enjoyed it. There were video games, table games and a fantastic movie theater showing movies all day long; in the evening there were snacks and drinks as well. Besides the dedicated kid spaces, there were 3 drop-in unsupervised ball rooms set up all week: a toddler room, a family game room (ping pong, pool table, basketball shot, air hockey) that we utilized every night and a movie room filled with bean bags, a popcorn machine and drinks; a different family movie was shown every night. I got the feeling that these rooms are not in operation during non-holiday times. If that wasn’t enough entertainment, there was a list of complimentary activities available throughout the day like shark tooth hunting, a puppet show, zoo animals brought in from the Jacksonville zoo, pool and beach games and an astronomer with a powerful telescope. Daily activities were listed in the lobby or a schedule could be had from the concierge. And my favorite: just about every evening there was a bonfire either on the beach or on the hotel lawn with marshmallows, s‘mores fixings and hot cocoa. Sometimes these bonfires were accompanied by a ghost story-telling pirate lady. Most of our time was spent on the beach. The beach was right outside the hotel accessed by 2 boardwalks that crossed over the dunes. There were lounge chairs already there and on the warmest days a hotel employee was available to set up beach umbrellas, distribute towels and bring water. There are many shells on the beach up near the chairs, which some people don’t like, but since collecting shells is one of my daughter’s favorite things to do, it was perfect for her. Just know that you will need shoes on this part of the beach, although the sand was smoother near the water. The water was freezing, so we didn’t go in, but some people did. We absolutely loved the beach and it was perfect for flying our kite, collecting shells and making sandcastles. The beach was pitch black at night, and when we went to the bonfire, we could have used a flashlight to find our way. However, I believe that at certain times of the year, flashlights are forbidden at night because of the turtles hatching eggs. The hotel has a sunrise watch every morning on the beach, but we didn’t make it (although we did watch it from our balcony). The spa was awesome! Check-in was friendly and gracious. Next I was taken on a tour of the facilities, shown how to use my locker and given a robe and spa slippers. After putting on my swimsuit I went to Wet Lounge for a soak in the huge hot tub before my massage. This room also has a steam room, sauna, showers and lounge chairs. Cold towels laced with ice and cucumbers were a welcome treat after my soak. Refreshed, I went into the lounge to wait to be called in for my appointment. The lounge is very soothing, decorated in green and white tones, with spacious and comfortable lounge chairs. There was tea, water and banana chips for snacks. I got to peek into the co-ed lounge; it has a fireplace and looks very inviting also – James and I have to come back for a couple-only trip. There is also an outside private spa pool and hot tub; you could really stay there all day. My massage, a Signature Massage with hot stones on my back, was fantastic. We were at the hotel for New Year’s Eve; there was so much going and it was packed. There was a big bowl game the next day, so it was a strange mix of football attire and New Year’s Eve glamour. The big deal at the hotel was the Masquerade Ball and people came dressed to the nines in tuxedoes, ball gowns and masks. Salt also offered 2 prix-fix dinner seatings. We didn’t do either of those things, but hung out in the lobby and had dinner there. Ritz Kids and Our Space had special programs going on that night (pre-registration was required and it was an extra fee). 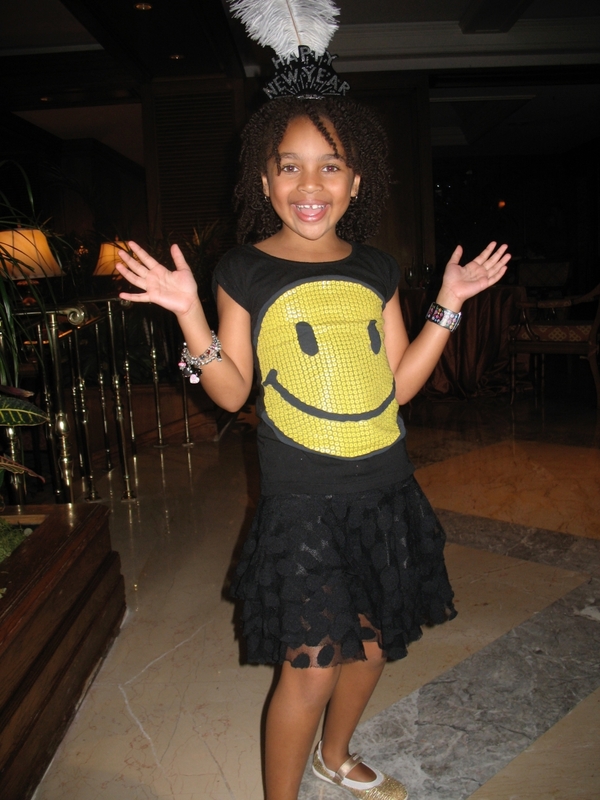 Even though it was expensive, it would have been nice to register our kids because all the children in the hotel were there and they looked like they were having fun. After dinner we went to the bonfire, family game room and movie room. Promptly at midnight the hotel had a fireworks show on the beach; we sat on our balcony and had a perfect view. Even though the food at the hotel was good, we enjoyed other restaurants on Amelia Island as well. Brett’s in historic downtown Fernandina Beach served the best fried shrimp basket that we ever had! We stopped in there between meals, so it was a limited menu; we need to go back next time for lunch or dinner. Sitting outside on the pier, watching the boats and huge pelicans, Brett’s was really nice. Another day we ate at The Happy Tomato Café, also downtown. We were surprised that they served BBQ as we thought they only served sandwiches, but it was very good and we were impressed. The Happy Tomato is very casual with counter ordering and courtyard (outside) seating. Not very far from The Ritz was Gourmet Gourmet near American Beach. Although we didn’t eat there (we stopped in the use the bathroom and bought key lime bars), the food looked very good . There is a small dining room, but this would be a good spot to get take-out to bring to the beach. Besides eating in historic downtown Fernandina, we browsed the shops lining the main street. It’s a cute town to walk around, but there weren’t really many stores that we would actually shop. I bought an ornament at the Christmas shop and some books about seashells in the bookstore for my daughter. For us the highlight of downtown was the fudge at Fantastic Fudge. Seriously this was the best fudge that we have ever eaten and we went back a few times! To stop each other from giving sharp elbow jabs, we had to carefully equally divide the fudge; it was that good! The island is small and easy to get around, so we were eager to explore. 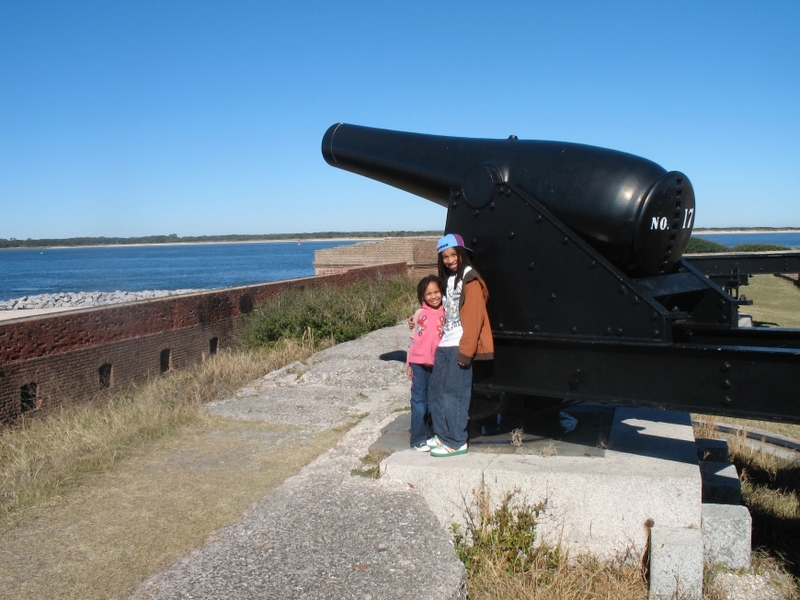 One day we went to Fort Clinch State Park; we were not sure what we would find, but eager to stay away from any alligators. Initially we didn’t intend to go inside the fort, thinking that it was just a bunch of stones, but when we did go in we were pleasantly surprised by all the history and details (staged rooms, real canons and even a costumed soldier present to answer questions). We really enjoyed the experience and stayed quite a long time (until the Confederate soldier started talking and we had to leave before my husband felt compelled to bring him back into the present). In the rest of the state park there are nature trails for bike riding or hiking, but after the fort we headed straight for the beach. The beach was beautiful! We stayed all day trying to fly a kite and collecting seashells (the sand was smooth and not full of shells like The Ritz-Carlton beach, but still plenty of shells to hunt). We met a wonderful family on vacation from New York and the highlight of the day was seeing a beached jellyfish. Another day we went to American Beach. 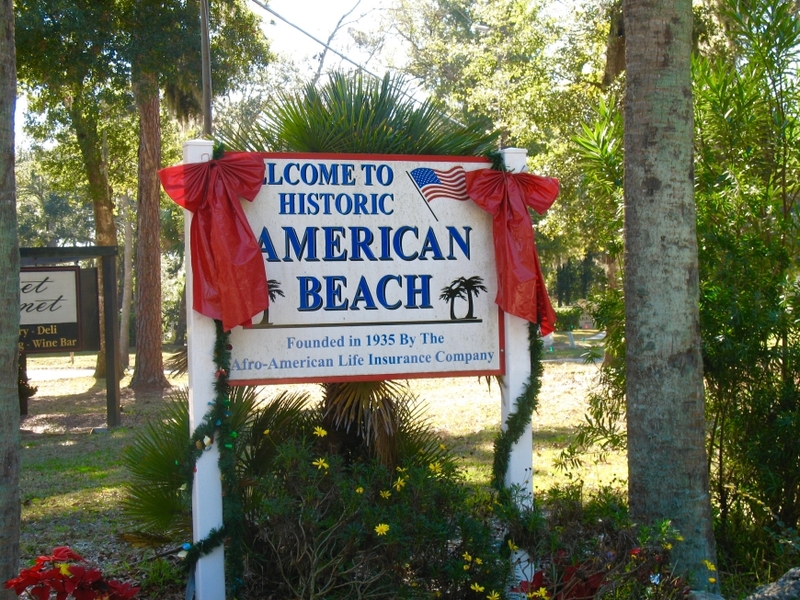 Tucked away in a little neighborhood of the same name, it was hard to find but we were determined because this beach is part of African American history. 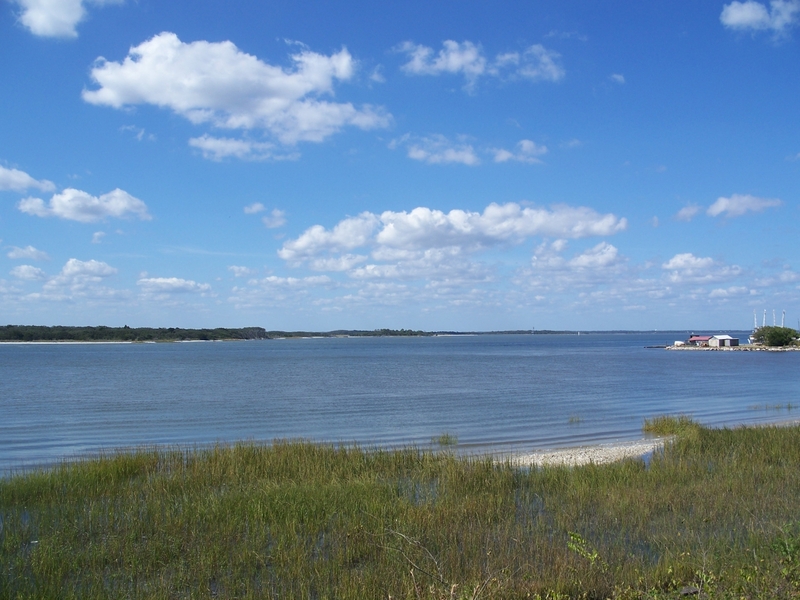 There’s so much that we didn’t get to do on this trip to Amelia Island (more beaches, horseback riding on the beach, ferry to Cumberland Island, tour of the lighthouse, bike riding) that I’m sure that we will be back soon! P.S. You may also like to read about our trip to Savannah and reviews of otherRitz-Carlton resorts. Wow looks so relaxing glad you got to get away!